Medicine Ball Metabolic Circuit- burn fat and work muscles! 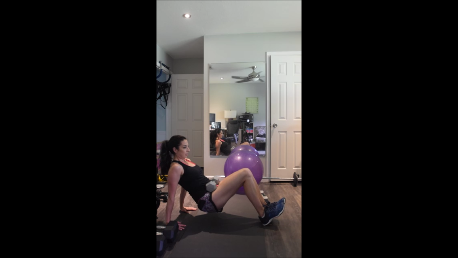 This medicine ball metabolic circuit is quick- it’s the perfect finisher for a strength training workout! It will get your heart rate up while still strengthening your body. There are four rounds of exercises, lasting 30 seconds to 1 minute with a short rest in between. You can repeat for 3-4 times for a nice metabolic boost that will keep you burning fat for a few hours after your workout! Full Body Dumbbell Workout – Only 30 minutes! This full body dumbbell workout takes about thirty minutes (and that includes a lot of exercise breakdowns in the video). It starts with heavier leg work coupled with plyometrics, then moves into Compound Exercises that will work both your upper and lower body, before we finally move to the floor to work our glutes and core. The workout decreases in intensity as the workout goes on. Sounds good, right? Welcome to Day 5! This is the Yoga Stretch routine. After all those weights and jumping around, let’s relax, stretch and open up our body. This will give you a much needed rest and to lengthen your muscles. No warm-up is needed for this yoga stretch routine. Just grab your yoga mat! Ready, let’s get to it! This is the second part of the push/pull split. This is your pulling exercises strength training routine! Pulling Exercises generally utilize the hamstrings, back and biceps and this workout will hit all of those muscles. You will need various weighted dumbbells for this workout, and I recommend using a minimum of 15 lbs (each, so a total of 30 lbs) for your legs. I will note my weights below. Body Weight Tabata Workout – Challenge Day 3! This body weight tabata workout is only ten minutes long! You can do this! No equipment is required and all you need is a little bit of space. Let’s get it done! There are many ways to structure a strength training routine. 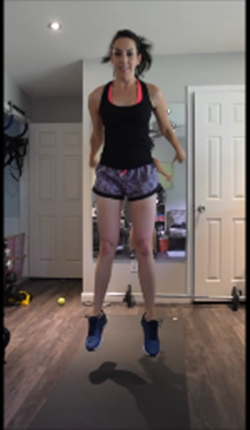 As part of the week long fitness challenge I decided to structure it with a “push” routine and a “pull” routine so that you won’t be giving one set of muscles a rest while working the others. This is your pushing exercises strength training routine! Pushing Exercises generally utilize the quadriceps, glutes, shoulders, chest and triceps, and this workout will hit all of those muscles. You will need various weighted dumbbells for this workout, and I recommend using a minimum of 15 lbs (each, so a total of 30 lbs) for your legs. I will note my weights below. Body Weight Full Body Metabolic Home Workout- work your entire body in only 15 minutes! Welcome to Day 1 of the Home Workout Challenge! This body weight full body metabolic home workout (that’s a mouthful!) will work your entire body in just 15 minutes! 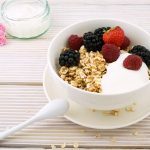 It will strengthen all the major muscle groups while burning fat. 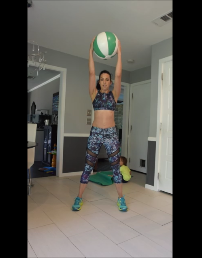 It’s a great workout for busy moms and or anyone who’s struggling to fit in a longer workout. 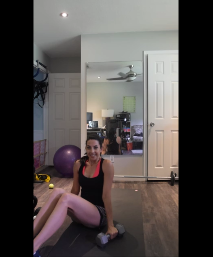 Full Body Warmup – prepare your glutes and core to work! This full body warmup is a little over ten minutes long and it will activate your glutes and your core, and you know what that means? That prevents knee and back pain! Your glutes need to be activated before you squat. From personal experience I know that I also need my quadriceps to be stretched and activated as well. This warmup includes both of these stretches and activations. 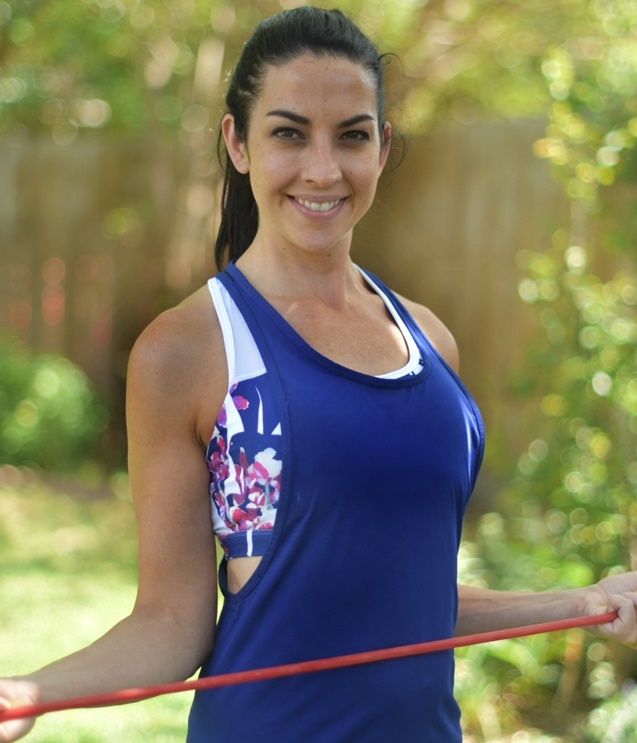 Shoulders Stretches – Open those rounded shoulders! Do you work at a desk most or all of the day? 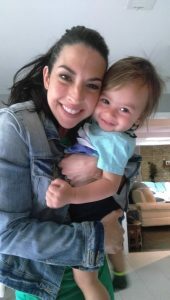 Are you a breastfeeding mama who is often hunched over your baby? Do you habitually slouch? All three? :-0 Try adding these shoulder stretches, which will help open up your rounded shoulders. Home Gym Essentials plus fun extras! Hello, lovely ladies and gents! 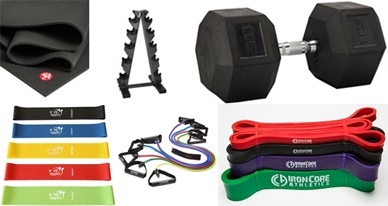 If you are working out at home then you are going to need some gear. 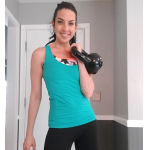 If you are wondering what to get (that you will actually get use out of) then check out my list of home gym essentials! Plus, I’ll give you a list of a few fun items that, while not essential, I love having and you might, too! Sign up for emails, and never miss a post! 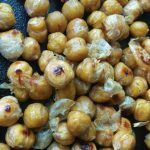 Roasted Chickpeas – a healthy, easy snack!